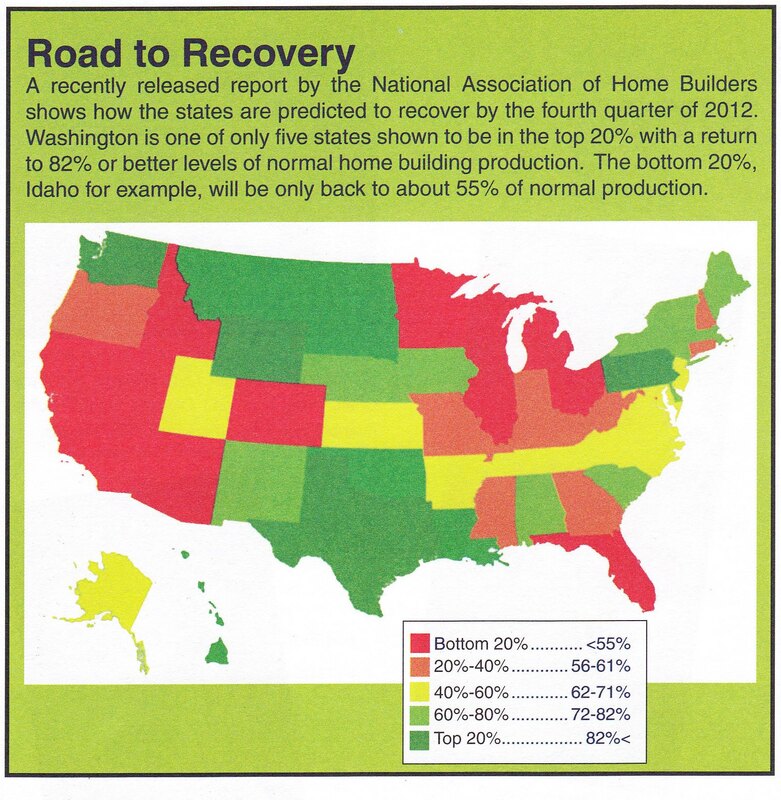 Washington building industry to recover by end of 2012. Our Wenatchee home inspection company is a member of the North Central Home Builders Association. In the May/June issue of the Building Industry Association of Washington’s Building Insight Newsletter they included the chart below. The green states show the best recovery predicted from 18 months from now. These are promising numbers. It is careful to note that the building demand may return but the cost of building may also increase. With many out-of-work skilled laborers finding different jobs and mills shutting down during this construction lull the labor and materials may be in short supply and thus increasing the cost of new homes. Those that are able to make investments right now are in a fine position to get the best deals. This entry was posted in biaw, builders, quarter housing market report, real estate, real estate data, real estate trends, washington real estate market and tagged biaw, building industry recovery, construction industry, home builders association, home inspection, housing market, leavenworth, seattle, seattle home inspection, seattle real estate, washington building industry, wenatchee, wenatchee home inspection, wenatchee homes, wenatchee real estate. Bookmark the permalink.